Outshot, outchanced, but not outscored. These have been the ways of the world for the Penguins for the majority of their last few bouts against opponents. Are these the new Penguins? The recent trend in Penguins games, since the return from the Olympic break, has been toward a team willfully being outplayed while limiting high quality chances. Is there a method to this madness? Is this the next evolution in Penguins hockey? A recent article over on The Pens Blog showed the dire situation that was the lack of possession time for the bottom lines of the Penguins. It's a worthy read and available here. For those in the tl;dr crowd the article, at the graphic within states that players like Taylor Pyatt, Tanner Glass, Craig Adams, Chris Conner and Joe Vitale are black holes when it comes to players carrying the puck up the ice and holding it in possession. A focus on allowing more shots, but lesser quality, could be an answer to this problem on the lesser lines. Telling the bottom six to not worry as much about generating chances and more on denying them leads to greater shots, but a focus on making sure the shots are from low percentage areas (outside of the circles) greatly limits the danger of these shots. A look at the shot charts since the dismal outdoor game in Chicago show this is a growing trend. A lot of shots have been pushed towards Fleury and Zatkoff. Most of them have been from areas with little danger of being quality chances, ones from the bottom of the circles on out. It's a system that Jacques Martin, as well as many other coaches, have run to much success in the past. It should come as no coincidence that this is happening down the stretch with Martin behind the bench. The acquisitions of Marcel Goc and, to a lesser extent, Lee Stempniak, mark perhaps a conscious effort to acquire players whose defensive prowess lie within their possession to improve this issue. The return of someone as simple as Beau Bennett should help this as well. In the meantime something needed to change. It seems it has. 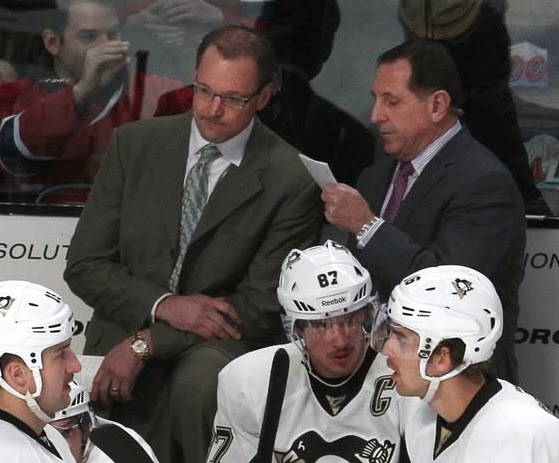 Are we seeing the next evolution of Penguins hockey under Dan Bylsma, or is this just a temporary adjustment for the team as they wait for their talent on injured reserved to return? It's hard to tell right now but people are noticing. Nothing wrong with winning 2-1.